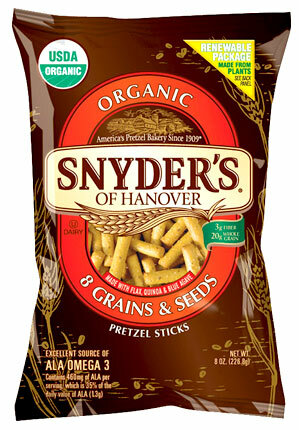 The PA snack-food maker delivers a “one-two sustainability punch” with bioplastic-based renewable, 100% compostable flexible packaging for its popular pretzel products. New 100-Calorie Pretzel Variety Sacks and Pretzel Sandwich Variety Packs are reportedly the first certified, fully compostable, outer retail package for multipack salted snacks. Read my Packaging Digest feature with plenty of converting, printing and packaging-process details HERE. This entry was posted in coating/laminating, flexible packaging, labels, paper/paperboard/cartons, sustainability and tagged bioplastics, boxes, cartons, converting, corrugated, flexible packaging, IADD-FSEA Odyssey, ink, labels, packaging, paperboard packaging, plastic film, printing, sustainability. Bookmark the permalink.